This is part 2 of our exclusive interview with Manjula Jain. In the first part (you can read it here), Manjula talked about her journey as a food vlogger on YouTube. Without much ado, let’s get started with part II. Q: Many may not know the gruelling schedule and effort you and your team put in to make each video. Can you share how many hours you invest in making each video – time spent in shooting, editing, promoting etc. 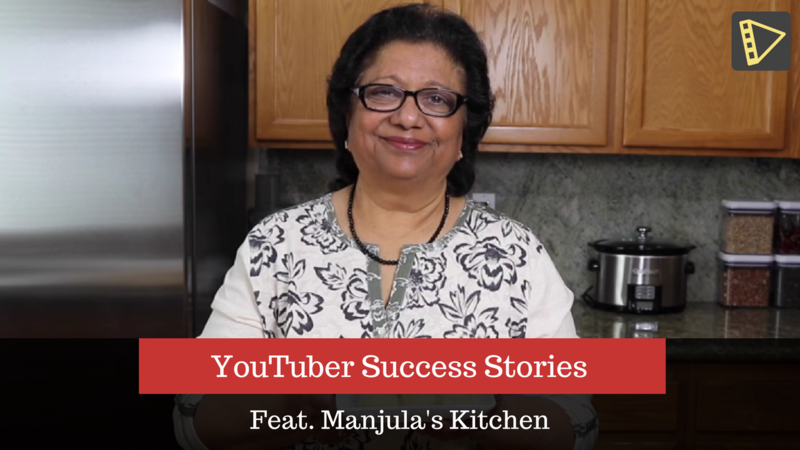 Manjula: I can spend anywhere from 5 hours to 12 hours in order to perfect a recipe because I make it my goal to make it easiest for my viewers and I also NEVER post a video without recreating the perfected recipe. It truly just depends on how extravagant the recipe is and whether I am able to get the flavor I wanted from it while making the video fairly simple to follow. From there, it takes about 2 hours to shoot a video and it takes my husband about 2 hours to edit the video. I only promote the videos by posting on Facebook and Pinterest. Q: As of today, you have published 395+ top quality videos on your channel. How have you been able to stay consistent and motivated as a vlogger to keep uploading quality videos so frequently? Manjula: As I said earlier, my motivation comes from the viewers and I love posting content that they will be able to easily recreate. Q: What do you enjoy most about your life as a successful YouTuber? Manjula: What I enjoy most about my life as a successful YouTuber – I started as a hobby and still working on it the same. But it is an incredible feeling that I have been able to help people worldwide through YouTube. I never imagined that I would become this successful and for that, I am grateful. Q: Manjula’s Kitchen, for many, stands for wholesome Indian vegan cooking. While most channel teach you how to make homemade food recipes, your channel even covers Pani Puri, Bhakarwadi etc which are more or less food items you don’t make at home. What’s your knowledge base and how do you keep yourself updated with new recipes? Manjula: My knowledge base about recipes comes from my mom who was wonderful cook. My sister and brother will tell me my cooking reminds them of my mom’s cooking, that’s the best compliment I can have. I still make similar recipes from my childhood with few changes. I keep myself updated with the new recipes by watching different YouTube videos and my recreating or getting inspiration from foods that I try when I go out. Manjula: I have come up with many recipes that were inspired by different things such as the Mango Coconut Panna Cotta, Pinwheel Samosa, the Chocolate Gulab Jamun and many more. I get inspiration from different places and combine it with other recipes. Q: What is your vision for Manjula’s Kitchen channel and manjulaskitchen.com for the future? Manjula: My vision is to make more videos that are different from what I have done before and those that are truly helpful in order to share what I have learnt over time. Enjoy what I do the best and my keep it as my hobby. 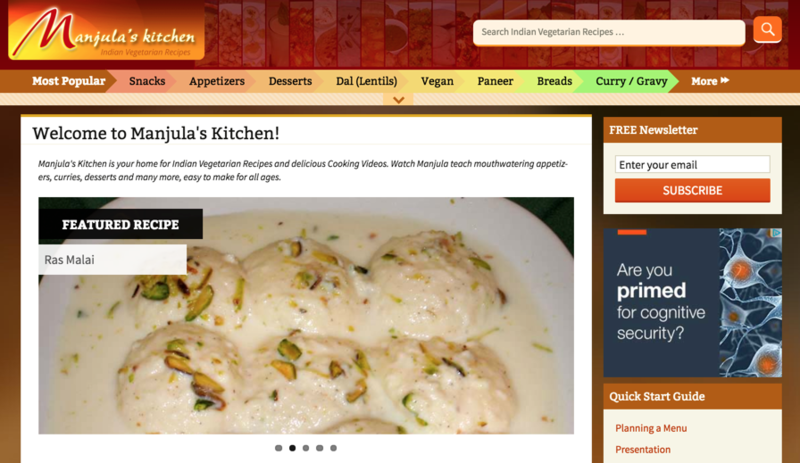 With 650K monthly visitors, manjulaskitchen.com is one of the most visited food websites focusing on Indian vegetarian delicacies. Q: Your 2 cents of advice to all budding YouTube creators and vloggers who create cooking videos? Manjula: If I were to give advice to new YouTubers, I would say that don’t hold back from trying new things and put out content / recipes that you believe is good. Post videos about recipes that you would serve to your families because that can help with inspiring you. Liked the interview? Make sure you leave a comment below. Feel free to ask questions and share what more would you like to learn about. We will make sure we share it with Manjula and get back to you. Congratulations to Manjula for getting the recognition she deserves. I have followed her for years. I have learned so much about Indian cooking from her and she is my go to site for something tasty and new for meals.Even my American grandkids love her cooking, even though they started out with simple palates.